Indoor air quality, or IAQ, is a measure of how the state of the air in a building affects the comfort, health, and efficiency of the people inside. The most important factors that help determine the quality of air in a building include the purity, velocity, temperature, and humidity of the air. 3 While the Environmental Protection Agency (EPA) doesn’t regulate indoor air quality, it does provide information and resources on how to maintain healthy IAQ. Why Is IAQ Important to Schools? Is there a preventive maintenance schedule in full operation, and is the schedule in compliance with the recommendations of the HVAC system manufacturer? Does the preventive maintenance schedule include air filter and belt changes, equipment lubrication, checking motors, and ensuring other equipment operation? 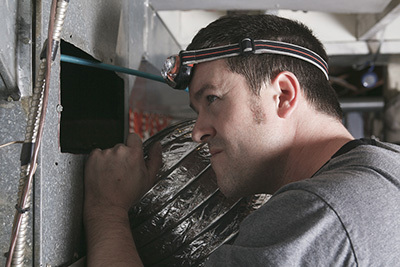 Are damaged parts of the HVAC system replaced or repaired as needed? Does any part of the HVAC system with standing water have microbial growth? Are any microbial growth contaminants taken out of the humidifiers, ducts, and other HVAC components along with carpets and ceilings? Is the HVAC system checked when CO2 levels reach more than 1,000 parts per million? If the outside temperature is 68 to 79 degrees Fahrenheit, is the HVAC system checked and repaired if it is not operating properly? Maintaining indoor air quality in schools can help promote healthy learning environments for children. By completing an HVAC program, you could position yourself well within this growing industry to assist in fixing a very real problem in our society: indoor air pollutants that cause sickness and low academic performance among children in U.S. schools.